The last week has been an all-around good one, and last Tuesday, in particular, was one of those days that reminded me why I love what I do for a living. It was busy, productive, and exciting. I didn’t even mind having to work late because everything was falling into place in exactly the way I wanted. On top of work going well, Tuesday was approaching the mid-way point of the Jewish Days of Awe (the ten days starting with Rosh Hashanah and ending with Yom Kippur), which is one of my favorite times of year because it’s a time for self-reflection and soul-searching, as well as a time for new beginnings. And if all of that wasn’t enough to make me happy, Fall was definitely in the air. So, as I said, Tuesday was good day! Having a good day meant that by the time I got home, I was ready for a warm dinner and a delicious glass of wine. In the spirit of the High Holy Days, I purchased a kosher red wine—the 2006 Petit Castel (winery, snooth). 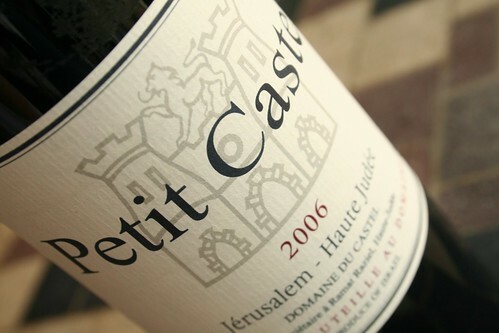 The Petit Castel was blend of 50% Cabernet Sauvignon, 45% Merlot, and 5% Petit Verdot with a deep ruby color. On the nose, there were blackberries, cherries, and blackcurrant leaf aromas, with a hint of smoke, cedar, menthol, and nutmeg. In the mouth, there were a lot of berries, along with cedar, smoke, and nutmeg. The wine had medium tannins, medium-to-high acidity, and a medium body. Is this worth a glass after work? Sure…you won’t be drinking anything out of the ordinary, but you’ll definitely have a decent, reliable glass of wine. At $40, this wine is a little pricey for not offering anything special. That said, as it can sometimes be hard to find a decent kosher wine, be assured that you definitely won’t be embarrassed by bringing the 2006 Petit Castel with you to Shabbat dinner. The wine was enjoyable on its own, as well as with the lasagna Hubby and I had for dinner.